Small 4 Style: Small 4 Style Meets Sharon Needles! Small 4 Style Meets Sharon Needles! Time to break out the false lashes and glitter! Rupaul's Drag Race season 4 winner, Sharon Needles, performed and visited with fans in San Antonio last weekend. 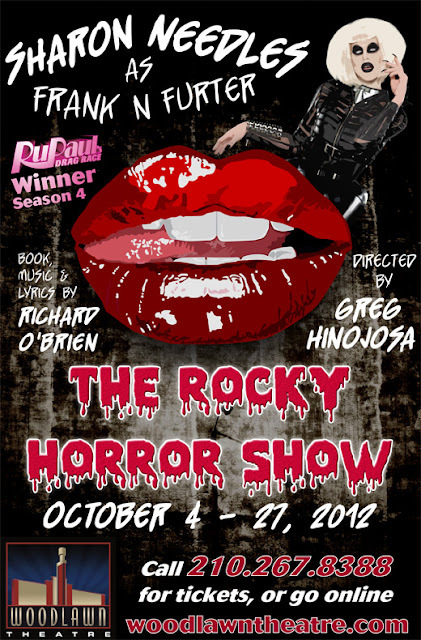 She's been in San Antonio for a month prepping to wow us in the "The Rocky Horror Show." I not only got to watch Sharon's version of "Rocky Horror" from the third row, I also got to meet her! Once I met her, she was so engaging and charming. We chatted about everything from faux fur to nails. I'm completely obsessed with the Sally Hansen nail stickers, and she totally noticed! Sharon wore the checkered ones when she was on TV. I was so excited! Me in mid-sentence with Sharon Needles. I was so excited to talk to her! Doesn't Sharon look so good?! Of course, I couldn't have met Sharon on my own! My cousin Brian got us the last 2 VIP tickets so we could meet our Drag Race favorite. When we were spending too much time with Sharon, the handler had to get involved... too funny!